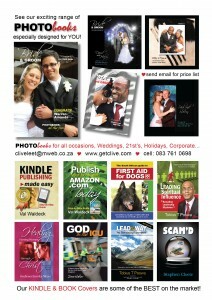 As eBook Covers and PHOTObooks are becoming more popular, we design some of the best on the market. Take a look at some of the samples on display. A small price to pay for BIG returns. eBook covers and KINDLE covers will cost you only R900 per cover. PHOTObooks — various sizes and amount of pages selected will determine the price.